caught with this passenger, there’s no bones about it! 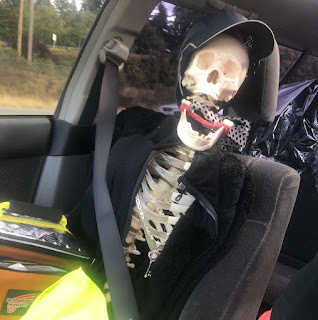 Another HOV violator stopped by WSP. They were looking for HOV lane violators - those people who use the high capacity / car pool lanes when they have no passengers. 17 motorcycle troopers worked areas that generate the most complaints of HOV violators. They contacted 1,756 solo drivers, issued 1,671 Citations and 85 Warnings. Throughout this week, 17 drivers were ticketed on 2 separate occasions and 1 driver was ticketed 3 separate times! The Washington State Patrol stresses that HOV violations do affect the transportation system as it is designed. The Washington State Department of Transportation (WSDOT) provided funding for this patrol.